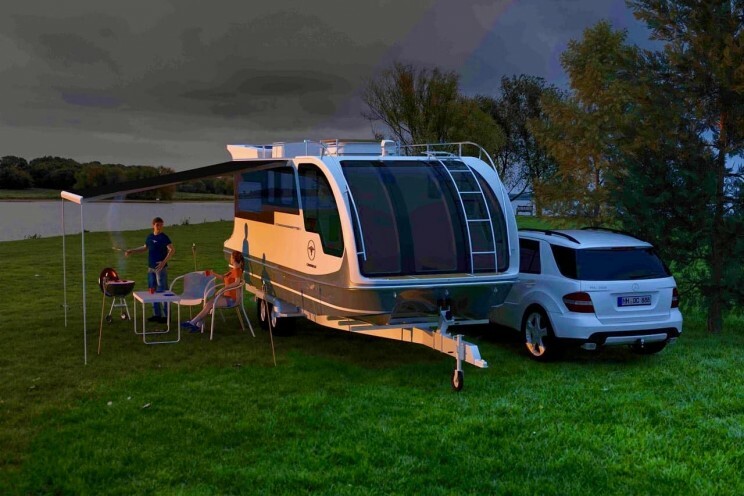 Give yourself a no-limits holiday with the Departure One, an adventurous vehicle both for land and water. Jumping in a recreational vehicle (RV) or caravan and hitting the road is a pleasure popular all over the world. 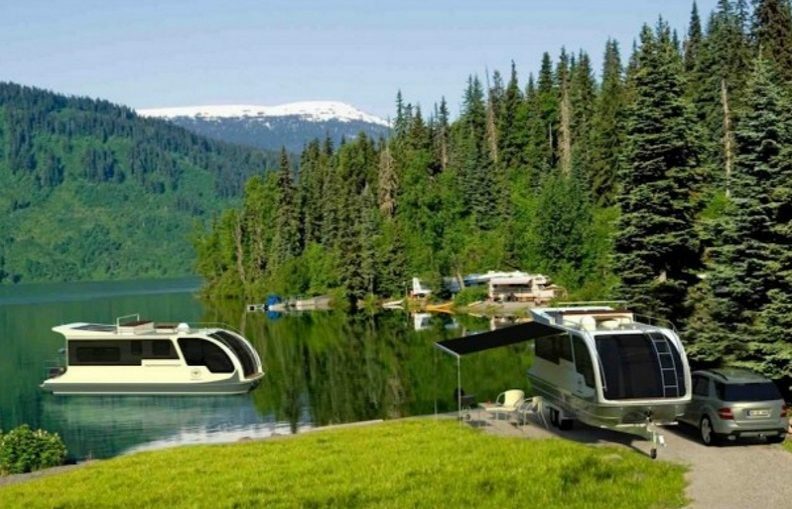 In recent months there have been a plethora of high-tech RVs and camping buses launching into the market, but there is one that stands out from the rest. The Departure One combines a caravan with a boat for a real no-limits holiday. 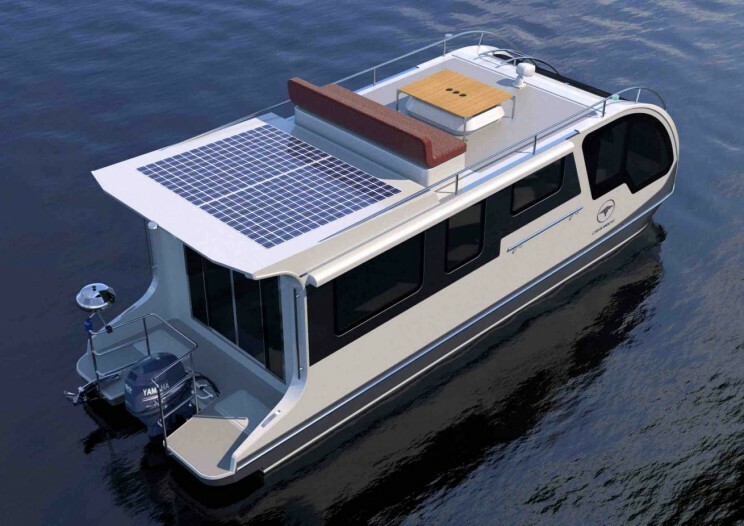 Created by German company CaravanBoat the Departure One is a fully self-sufficient vehicle for use on both land and water. The Departure One lets you both cruise through the country then navigate new waterways. 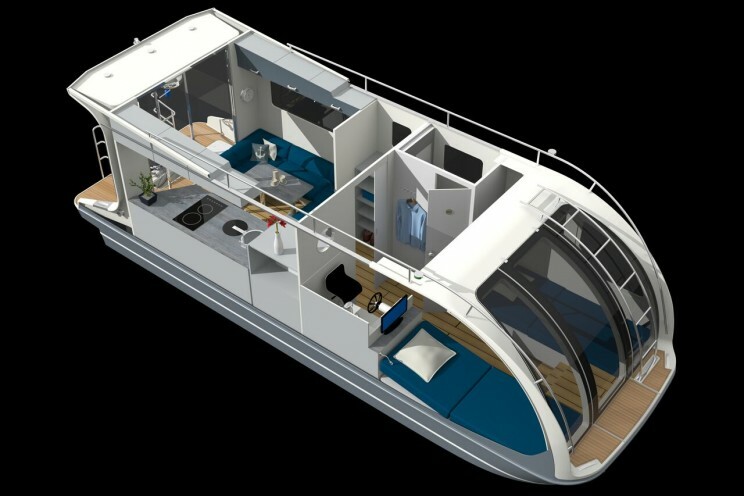 The crazy floating caravan doesn’t skimp on luxury featuring an ‘efficient’ kitchen, WC and shower as well as a covered terrace. The Departure One is designed for two people to travel for two days without additional electrical power or water supplies. 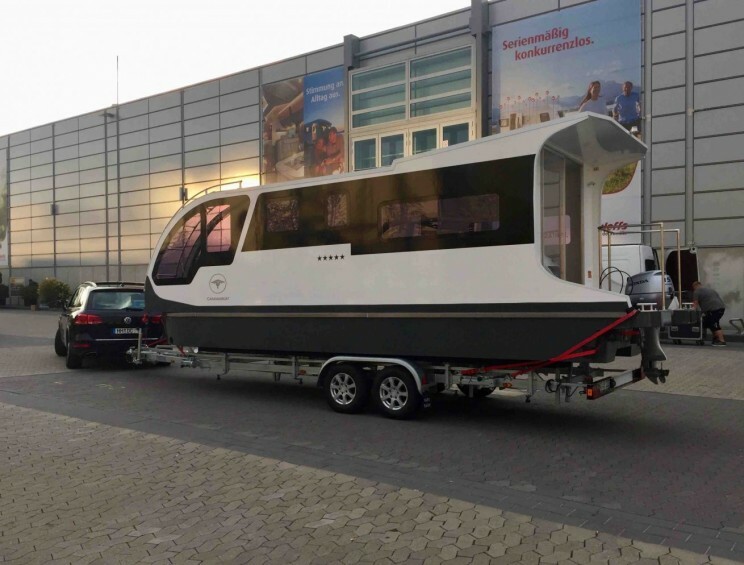 The flexible holiday home is able to be towed behind a regular passenger car (with some limitations) or can be transported by truck to your beginning destination. While towing a large boat isn’t everyone’s cup of tea, there is no doubt the flexibility of being able to drive comfortably to remote waterways before exploring from the water is appealing to many. The Departure One’s design is based on the original Caravan Boats that launched in the Uk and Australia in the 1960s. 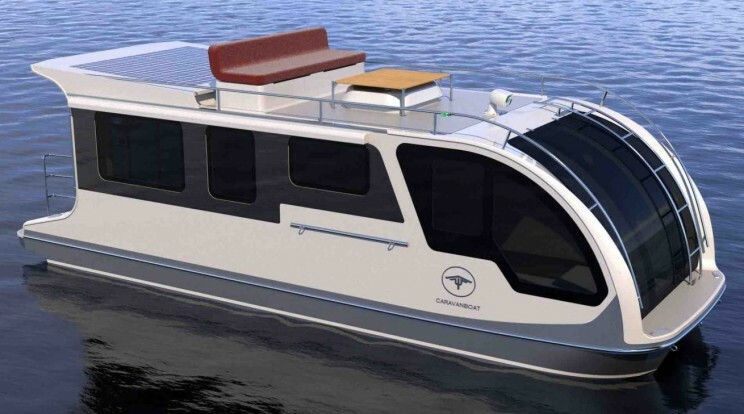 The unusual vessel is made in Germany and the base model is available for a reasonable 58, 000 Euro. The vessel has a total overall length of 9m and a total weight of 2.3t. 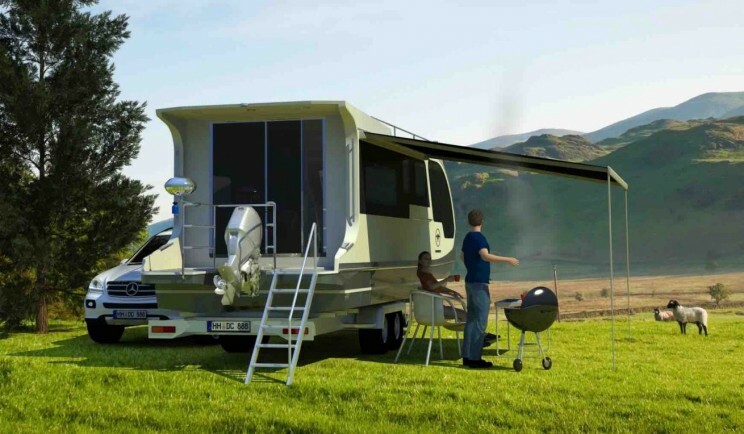 Caravanning is associated with freedom to drive and stay wherever you want. In fact, the history of caravanning can be linked back to groups of travelers who traversed both Europe and the U.S selling goods and transporting news between towns. Today traveling in an RV is a popular holiday choice for families and couples all over the world. One of the famous stories of early caravanning involves William Gordon Stables (1840–1910), a former naval surgeon turned author. In 1885, Stables reportedly took his specially-designed caravan, nicknamed the ‘Wanderer’, to Scotland. It was pulled by two horses. Along for the ride was his servant, Foley, whose tasks included cycling ahead of the caravan on a tricycle to check the roads were sufficient for the heavy load.